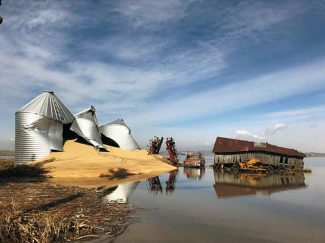 Millions of bushels of grain have spilled from broken bins into flood waters along the Missouri River bottoms in Iowa after recent heavy rains. 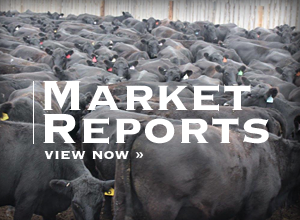 The immediate costs associated with the flooding in Nebraska and surrounding states are being calculated as the water recedes but the impact of the flooding on the commodity markets is yet to be seen. Troy Bredenkamp, executive director of Renewable Fuels Nebraska said the costs associated with the ethanol industry in the state are multifaceted although the long-term effects are not yet known. He said there has been a bit of an uptick in the wholesale price as an estimated 20 percent of the nation's ethanol plants are idled due to conditions, and about the same in Nebraska as a result of the flooding. "Not sure where that's going to go long-term but I can tell you this without a doubt," he said. "The cost of production is going to go significantly higher than it has been. Transportation costs — we have a rail system that was knocked out so several of our rail options aren't there." Rail, he said, is the most efficient method of transporting ethanol to end users in places like California. With fewer options to move the ethanol from the plants, many plants are running on halved production or are nearly full and will have to cease production all together temporarily. This is causing issues for livestock producers. "We're long on ethanol that we can't move very easily and if we're not keeping the plant running, we're not making more distillers and we're getting short on feed in some places as well," he said. As grain bins are flooded and grain is damaged, some producers are losing one year's harvest in the bin and another they may or may not be able to plant this year. "At least locally, from a local basis perspective, I think we're going to see a pretty significant increase in corn prices simply because locally it's not going to be as available as it has been," he said. "That's going to be a further addition into our production costs." While not all tillable acres in the eastern portion of the state were impacted, a significant number of river bottom acres were and Bredenkamp said those acres may not produce the same as they did prior to the flooding. With high snow pack numbers and high river levels to the state's north and west, he said flooding may be an issue for some for some time. "It's all got to come down the Platte and the Missouri," he said. "Those bottom areas are going to be in for some challenging times for a lot of the summer." 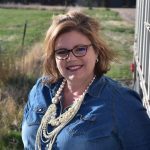 Emergency grazing on Conservation Reserve Program acres has been approved for cattle producers though he said many cattle feeders are struggling because of higher transportation costs as well. Looking at the market nationwide, Stephen Koontz, agriculture economics professor at Colorado State University, said while this is a large disaster, history suggests the main impact will be local. "It'll create some nervousness short term but if you think about all the land that's being worked in Nebraska and how much is close to the Platte River and the Elkhorn, it's really bad for those producers but I don't think it'll have a long term effect," he said. There's no doubt the producers who experienced the flooding will not forget it soon, Koontz said the markets are likely to forget after a period of volatility. The hay market, he said, shouldn't be tremendously impacted and may soften, with the exception of high-quality alfalfa and dairy grade hay. With so much wet weather across the country, there is likely to be ample pasture and hay, albeit likely rained upon hay. "I don't want to dismiss this and say it's not a problem because it is, especially for the folks right there," he said. "The overall market impact, the shift between the acres of beans to corn and the potential of what happens on the trade floor will have a much bigger impact than this potential weather." Nebraska Farm Bureau Senior Economist Jay Rempe echoes Koontz's prediction that the markets will settle down. 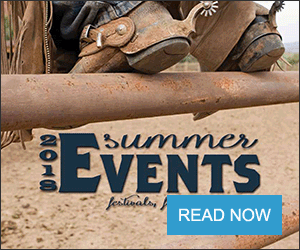 The added cost of transportation due to damaged infrastructure and the challenges of getting crops and livestock to marketing channels will be shouldered by producers, he said. A number of grain storage facilities also sustained damage, making some grain unmarketable and perhaps forcing some producers to utilize different marketing channels while repairs are made. Rempe said some farmers affected by the 2011 flooding experienced multiple years of lower yields before fields produced yields they said were close to normal.